Real Estate Scorecard continues to hear from Baby Boomers who are planning to relocate, that choosing a new home is one of the most important decisions they have left to make. Naturally, they want it to be energy efficient and affordable. Equally important is for it to be low maintenance. Although many retirees enjoy gardening, they don’t want or have time to be saddled with lawn maintenance. Retirement is when they want to travel, play golf and enjoy their golden years. And as many plan to age-in-place, they don’t mind the idea of living in an attached home with neighbors nearby. Logan Homes, one of the finest Wilmington NC home builders, has recently designed attractive one level floor plans with retirees in mind. From vaulted ceilings to finely crafted finishes - their Towns Collection reflects all the quality and excellence that Logan Homes has to offer. This collection touts spacious master suites, well-appointed kitchens as well as gracious covered porches to enjoy the coastal climate. At Park Landing Towns in Brunswick Forest, Logan Homes’ new Seagrass I model, an 1,800 square foot 3 bedroom, 2 bath town home with a two car garage is a perfect match. The open floor plan has lots of space, and features a vaulted ceiling in the main living areas as well as a trey ceiling in the master suite, which also features a walk-in closet and dual vanities. Hardwood floors throughout the formal areas are an added bonus. A screened porch and patio adds additional space ideal for outdoor entertaining. Another added feature of this home is the optional bonus room with a full bath offering guests a private suite. 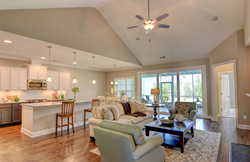 Boomers appreciate split floor plans, large master bedrooms and a great room/kitchen area. They desire bright and cheery windows and tall ceilings. What’s super smart about the way they designed these new Wilmington NC homes, is how the garages meet in the middle of the building providing a natural sound barrier. And who wouldn’t like the low $300,000 price point? Logan Homes is building this model at two of the best neighborhoods in Wilmington NC, Brunswick Forest and St. James Plantation. Although the Park Landing Towns neighborhood is almost sold out, Logan Homes is breaking ground on new town homes in the Cypress Pointe neighborhood of Brunswick Forest. All this adds up to a lower maintenance costs all around. Logan Home has a stellar building reputation in the Carolinas, in both the Wilmington area of North Carolina and Beaufort/Bluffton South Carolina. They have fully-appointed Design Studios in both locations. Real Estate Scorecard encourages folks to visit their studios, explore their new website and see new move-in ready homes and floor plans along with reading customer reviews and testimonials. Here’s a sneak preview now - Interactive 3D Tours. Whether folks want to live close to downtown Wilmington or in the Lowcountry, near the beach or on a golf course, the Builder Specialists at Logan Homes can help one find the ideal community or home site perfectly suited to your lifestyle. Call them directly at 800.761.4707 for more info.